Students of Iolani School have a study session in front of a statue of young Sun Yat-sen. Sun arrived in Hawaii at age 13 and spent three years in the school. When China's founding father Sun Yat-sen first saw Hawaii, he was a young teenager going to join his brother. Later, the islands' Chinese community would be the first overseas Chinese group to support his budding revolution. On the 100th anniversary of the 1911 Revolution, Hu Yongqi and Peng Yining report from Honolulu. The contribution of the overseas Chinese community to the success of the 1911 Revolution is widely recognized. "When we look back, we cannot forget those who contributed to Doctor Sun Yat-sen's revolution and the establishment and reform of modern China," says Xu Yousheng, vice-minister of the Overseas Chinese Affairs Office of the State Council, speaking at a commemorative concert in Honolulu. "As Dr Sun himself said, 'The overseas Chinese community was the mother of the Chinese revolution.'" The revolution, also known as the Xinhai Revolution after the name of the Chinese year it happened, marked the beginning of modern China. On Oct 10, 1911, Sun and his comrades overthrew the Qing Dynasty, thus ending more than 2,000 years of feudal rule in China. Xu was right. It would never have happened without the support of the overseas Chinese, especially the community in Hawaii. 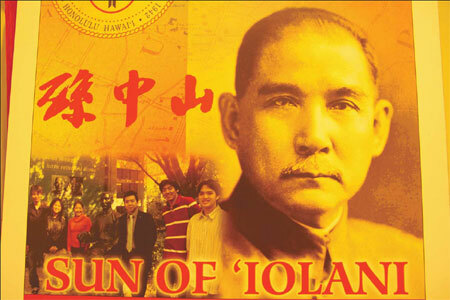 In 1879, Sun Yat-sen first arrived in Hawaii at the age of 13, sponsored by his brother Sun Mei. The older Sun, like many overseas Chinese, had left his impoverished home village in Guangdong province to start a new life in Hawaii. And like many overseas Chinese, his hard work and bravery was rewarded with success and wealth. His prosperity gave him the chance to offer his younger brother the opportunity to come to Hawaii to study, according to Yen Chun, vice president of Sun Yat-sen Hawaii Foundation. Later, Sun Mei donated more than $75,000 to his brother's revolutionary cause in 1906, and practically exhausted his wealth. He was not the only one. The rest of the Chinese community in Hawaii also rallied around Sun Yat-sen and many became his earliest and staunchest supporters. It was in Hawaii that Sun founded the Xingzhong Hui (Revive China Society), the first revolutionary organization he formed, and an important milestone in the history of modern China. From 1894 to 1895, about 125 Chinese in Hawaii joined the Xingzhong Hui, most of whom were small merchants, workers and intellectuals. Their activities are recorded in Sun Yat-sen in Hawaii: Activities and Supporters, published by Yansheng Ma Lum and Raymond Mun Kong Lum in 1999. Later, the society's headquarters would be moved to Hong Kong. In August 1905, Sun reorganized the Xingzhong Hui into the Tongmeng Hui (Alliance Society) and based it in Tokyo where he was living. But Sun never forgot his early years in Hawaii. His student days there would influence him in later life and it was also here that the seeds of Western democracy were planted in his young mind. It was the first place he returned to when he needed help for his revolution. To organize uprisings against the Qing Dynasty, Sun traveled the world to raise funds from the overseas Chinese with which to purchase weapons and ammunition and support the army. From 1894 to 1925, the Chinese in Hawaii contributed a total of $250,000 in support of the revolution. Some also sacrificed their lives for the cause. Among them was Lu How-tung, Sun's childhood friend. Lu instigated the first Guangdong uprising in 1895 with Sun, but was arrested and executed. He was one of the first martyrs to sacrifice his life for the revolution. In all, Sun staged 10 uprisings against the Qing before the Wuchang Uprising on Oct 10, 1911 finally led to the collapse of Qing Dynasty and the establishment of the Republic of China. It is an achievement that still excites passion today. Robert Ching, a Hawaiian-born Chinese in his 60s, could not stop cheering at a concert commemorating the 100th anniversary of the revolution in Honolulu. At the concert held at the Neal S. Blaisdell Concert Hall, he was entertained by a cultural troupe of singers and dancers under the wing of the Overseas Chinese Affairs Office of the State Council and China Overseas. During the anniversary celebrations, the Office had sent out three troupes to perform in places where Dr Sun Yat-sen had lived and traveled, including North America, Southeast Asia, and East Asia (Republic of Korea and Japan). Honolulu was an indispensable stop, and the celebrations included the concert and a photo exhibition held before the National Day holiday. For Robert Ching, the concert was the highlight. The retired naval officer had been learning Chinese for more than 10 years, and apart from his passion for the language, he is also a huge fan of Chinese culture. He would be the first to rush for a ticket whenever there was a performance. "The cultural performance let me experience authentic Chinese arts. I am most interested in Peking opera," Ching says. He has maintained his connection to his ancestral homeland as vice president of the See Dai Doo Society, which gathers together more than 2, 000 Hawaiian Chinese whose origins are from Zhongshan in Guangdong province. More than a century ago, the society did its part by contributing $2,000 to the Xinhai Revolution. And now, a rare photograph of Sun Yat-sen in military uniform hangs in the hall of the See Dai Doo Building. 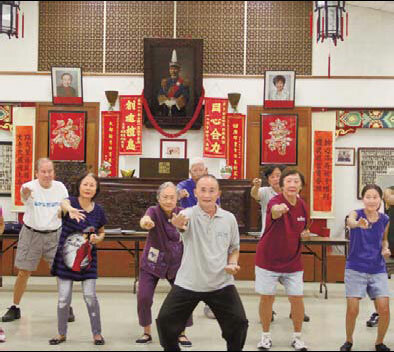 Every Tuesday night, about 20 members gather here to practice tai chi, and sometimes they also gather to remember the close ties between the society and Dr Sun, who was also a Zhongshan native. A century has gone by, but Dr Sun and the revolution are still deeply entrenched in the memories of many overseas Chinese, a legacy that they carefully preserve. Roger Ames, former director of the Center for Chinese Studies at the University of Hawaii at Manoa, says: "Everybody in Hawaii ought to know Sun Yat-sen. He is a son of Hawaii." Ames says Sun was a man of extraordinary vision, in the writing of the constitution, and in interpreting democratic theories." He was ahead of everybody (in China) and he actually wanted a bloodless revolution." In recognition of the links between Hawaii and its people and Dr Sun and his contributions to Hawaii, the Honolulu City Council had declared 2011 the Year of Dr Sun Yat-sen in Hawaii. You can contact the writers at huyongqi@chinadaily.com.cn and pengyining@chinadaily.com.cn.